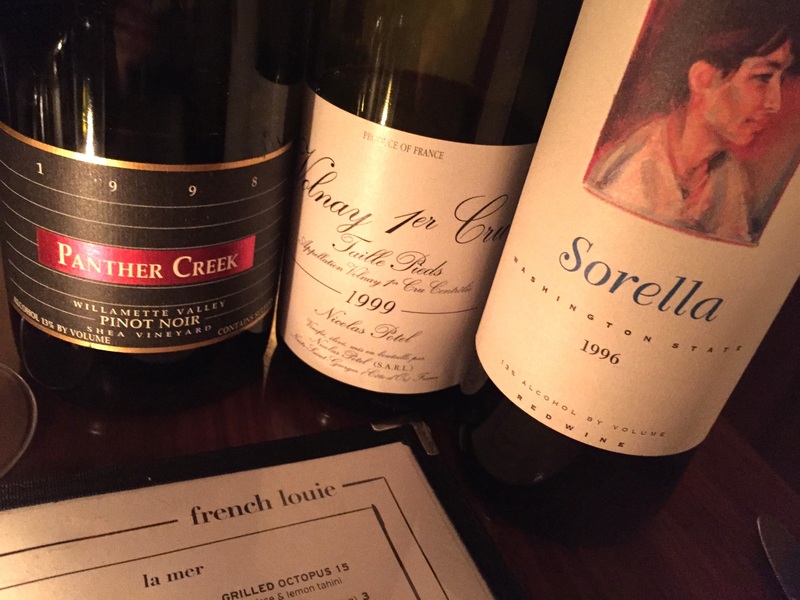 Back at St Anselm for the butcher’s steak, again braving the $25 corkage fee and bringing some properly aged Pinot: Domaine Serene Pinot Noir Evanstad Reserve 2003 and Belles Soeurs Pinot Noir Shea Vineyard 2000. I had originally planned to taste the ’03 Evanstad along side a 2004 Jayer Gilles Echezeaux du Dessus, as both have exhibited similar traits in the past. However the wrong bottle was packed that evening and the rare Echezeaux in question ended up preceding a youthfully clumsy Domain Serene Pinot Noir Willamette 2004 (a vintage that should prove to be long lived). I’m listening to “Seeing Things” from the Black Crowes’ debut 1990 LP, Shake Your Money Maker. Early in high school, it was something of a revelation that a bunch of young guys could deliberately make new music that fit in with much of the classic rock hits of ‘60s and ‘70s. And it was no surprise that it was through Classic Rock radio, not pop, that the Crowes were first heard by so many. This was also when I first became aware of a thing called critics and that they largely did not like the Black Crowes, nor did pop radio, which wanted nothing to do with them, until their cover of Otis Redding’s “Hard to Handle” became a hit too big to be ignored. Sure, they were just another bunch of pretty(ish) white kids playing the blues, a time honored formula since Elvis, but at that time I didn’t know the history, and the Crowes were really good at it. Because of that, and an impressive body of work, up to and including the Amorica LP, for a certain segment of Gen Pop, the Black Crowes will always embody Rock & Roll. 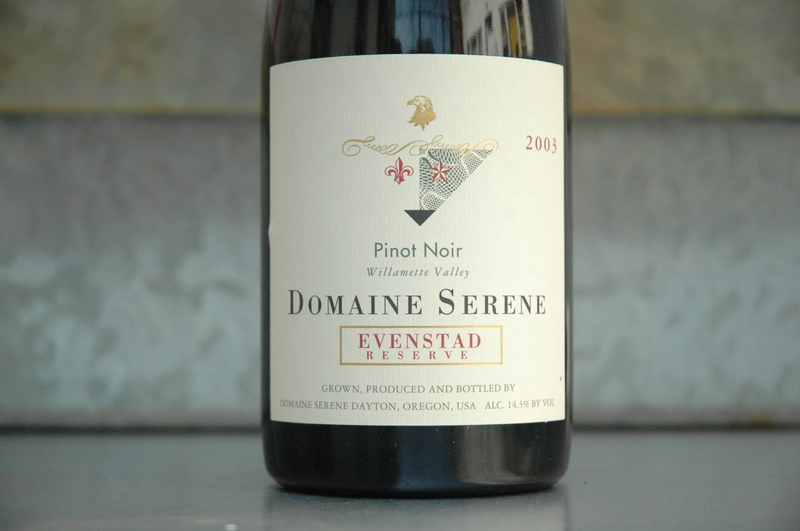 The Domaine Serene Pinot Noir Evenstad Reserve 2003 has a component of damp leaves, but displays little if any of that mossy, wet earth, swampiness, on the palate, that is so typical of much of the ’03 vintage for OR Pinot Noir (as well as of scattered varietals and sub-regions of northern CA, of the same year). Instead there’s an unexpected sweet roundness to this reserve Pinot, led by dry raspberry and black cherry, with subtler notes of cocoa powder and chalkdust. After 40+ minutes of breathing the ’03 Evenstad shows deep cherry sweetness and a long vein of vanillin, sprinkled with baking spices and white pepper. 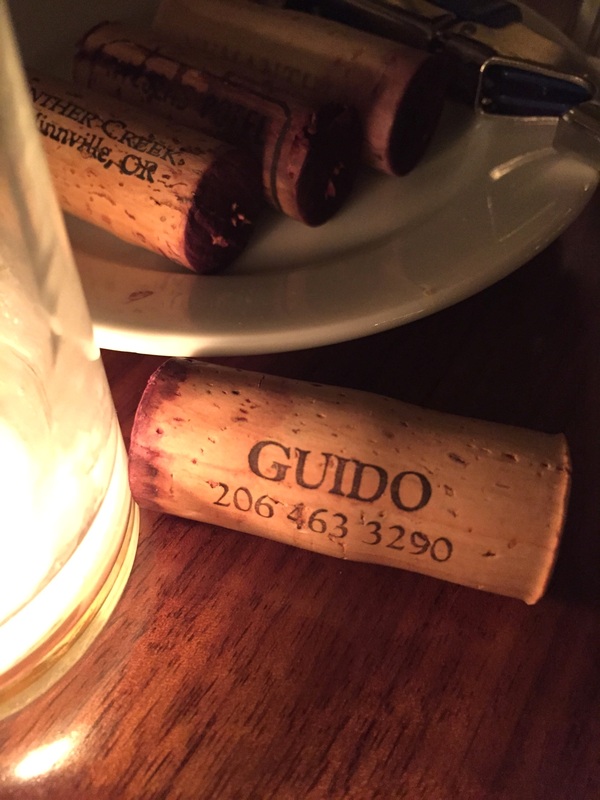 This is a wine of excellent concentration without sacrificing the purity of the fruit; it maintains a broad mouthfeel and seamless integration. 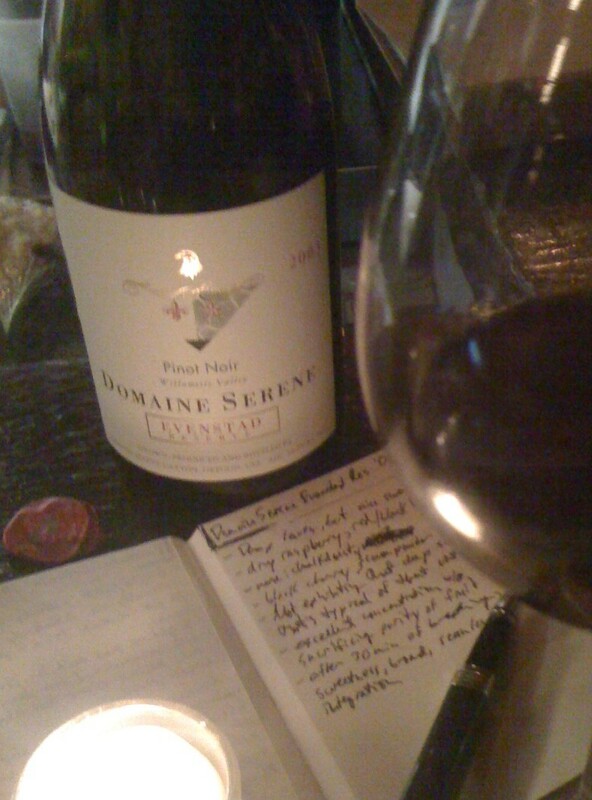 Domaine Serene Pinot Noir Evenstad Reserve 2003 seems right at its peak drinking window now and should drink nicely for at least another 5 years.